To be honest we don't eat fries that much, but when we do it is either sweet potato fries, which I bake, or regular tators which I do fry. 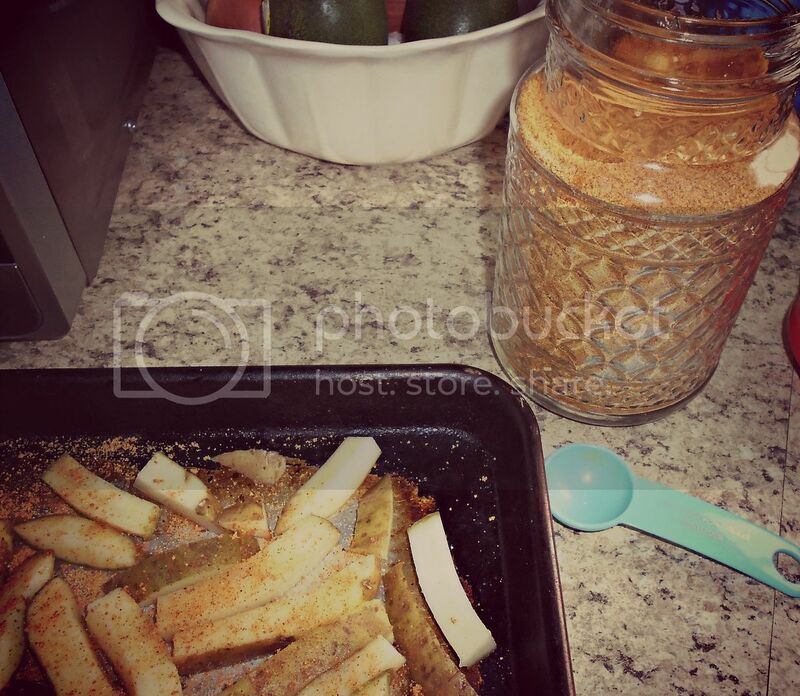 The sweet potato fries I toss in EVOO and then make a homemade seasoning mix of-brown sugar, cumin, red pepper, and whatever else I am in the mood for. Wish I could help with baked fires....can't wait to see what others say. When we do fry we soak ours in water for awhile before frying. They are much more crispy. I soak mine in salted water in the fridge for about 30 minutes. Rinse well, put into between 2 dish towels and let dry until the outside isnt slippery (about 20 minutes). Toss in oil or butter. Season with half the seasoning. Bake at 400 for 20 minutes, flip and bake another 20 minutes. Remove and toss in remaining seasoning. Crispy and soft. I think the rinse and dry gets off any starch that make the oil and seasoning not to cling to the fry properly. Oh I hope you get an answer because I am in the same boat.. they never seem to crisp up for me. I hardly ever buy prepackaged fries. When we want fries I make homemade. I bake mine on 450 for about 40-45 minutes or until they way you like them probably depending on oven too. I lightly spray the cookie sheet before putting the fries on and lightly spray the fries after I put them on the cookie sheet. We like them better than prepackaged fries. We make homemade fries. No baking times, but it does take a while. I usually bake them at 425 for at least 25 minutes. The longer the better. I also have a convect feature on my oven so sometimes I will turn the oven to 400 and use convection. I cut the fries as thin as possible and use about two tablespoons of olive oil on them. Then toss them with your hands until they are completely coated in oil. Bake until they are browning. We like them very brownish and crispy. Then we sprinkle with seasoned salt and serve. Yum. I toss them them in a freezer bag with a drizzle of olive oil, and seasonings. I have a recipe on my blog, right here if you'd like to try them out. Hope it's okay to put the link here! I hope it helps. I cut mine, put into a bowl, run cold water over them (gets some of the starch off), pat dry. season with olive oil and seasonings .. cook 350 for 30-40 minutes! Try cutting them thinner- coated in enough olive oil to be covered, but not soaking. I've cooked them anywhere between 400 and 450 depending on what else is in the oven. Also, don't overcrowd them. They stay soggier that way. (Soggier- that's a word, right? ha!) I usually find in a convection oven, at 400 they are nice and crispy in about 20 minutes- flipping them halfway through. I would try cutting them a bit thinner- coating them in olive oil in a 400 oven for about 20 minutes (on parchment paper). Also, don't overcrowd them, they don't crisp up well. Good luck!! Maybe boil (to soften inside first) then bake with a little evoo until they're where you want them, crispy-wise? I put olive oil in a little spray bottle...spray the potatoes and sprinkle with salt. You can also spray them with cooking spray, but the olive oil is chemical free:) Bake until crispy. Yummy! I spray my pan with nonstick spray, season the pan (I like season salt or garlic salt and pepper), then I lay the fries I've pre-sliced to no more than 1/4 inch thick, spray and season again. I bake them at 425 for about 20-25 mins. If you foil the pan it makes for no clean up :) I hope you give it a whirl! Preheat oven to 425. 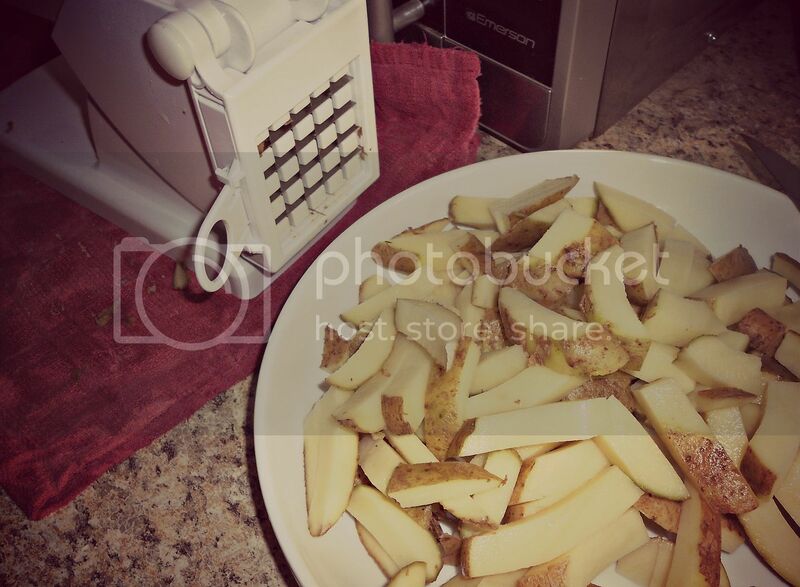 Thinly slice potatoes to no more than 1/4 inch strips, pat dry when you have the amount you're looking for. 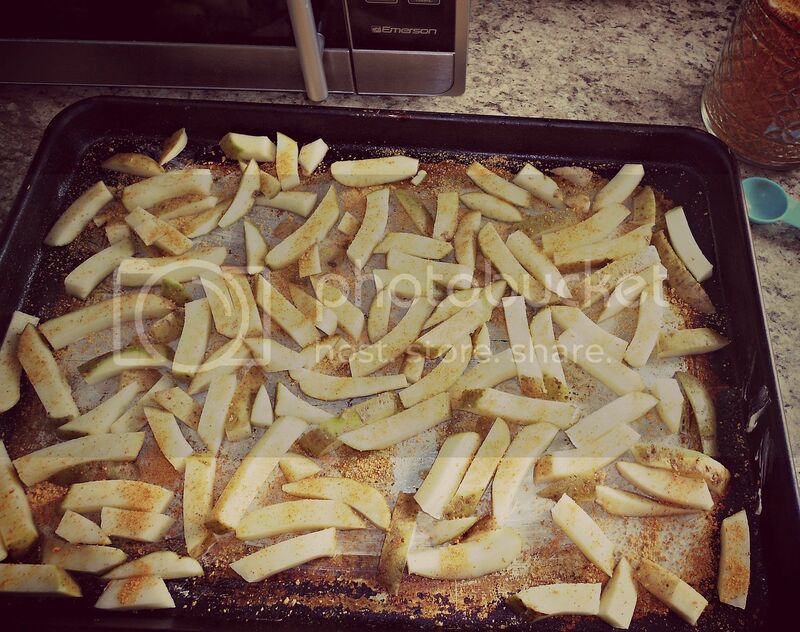 Line pan with foil, spray with nonstick spray, season (we like garlic salt or my grandmother's seasoning [salt pepper garlic powder onion powder paprika cloves and a pinch of sugar]), lay fries on sheet in single layer not touching if possible, spray and season again. Bake for 20-25 mins. The bottoms will be nice and crispy and soft inside. Good luck and I hope you like them! Oh and I cook mine on 400 for about 25-30 minutes, depending on the thickness of the cut. Hi. I usually put mine in the microwave first. After chopping them, put in a big bowl with oil and cook on high for 5-10 minutes, until you can pierce with a fork. Then put on a baking sheet (with parchment paper for easy cleanup), add spices, and broil. Works with sweet potatoes too. They aren't as crispy as fried but much healthier. Good luck! 1. Cut potatoes just like you did and make sure they are DRY. 2. Have a bowl of olive oil or coconut oil (I started using this only, but both work)...I don't measure, just pour in a little oil. 3. Drop several potatoes in the bowl and mix them around to coat each one. I do this several times (pour oil, coat potatoes) until all potatoes are coated. 4. Lay them out on baking sheet...TRY NOT TO LET THEM TOUCH...if they are touching they will just steam and not get CRISPY. Sometimes I have to use 2 baking sheets to have enough room. Season before baking. 5. Bake at 375 for 10 minutes. Take out and flip each one over with tongs and bake another 5-8 minutes (you can season again if you want). You don't have to flip them, but I find they are a little crispier if you do. I've done both and like them both ways. Sweet potatoes take a little longer to bake. Hope they turn out great. And I always foil for easy clean up! We love oven fries at our house. I brush the cut potatoes with a couple of tablespoons of oil and bake at 450 degrees for about a half hour (or a bit longer). I like to let them get golden brown and pretty crispy. We like ours with just salt, but you could use any seasoning you like. Sometimes I add other vegetables (cut up carrots, zucchini, onion) for a roasted vegetable side dish. I've heard that soaking the potatoes in ice water, then draining and patting dry helps them get crispy, but I rarely take time for that step. Good luck and enjoy! I drizzle olive oil on my homemade baked fries. First of all, you can't bake them raw like this in the oven. You need an frying pan with oil, you heat the oil up to 200° celsius and you bake your fries a first time, until half baked. Then you take them out and let them coll down completely. Then again you put them in your frying pan until crisp and gold brown. You can use olive oil, but any oil that resists to high heat will do. Maybe if you precook them until almost done then toss them in a little bit of oil and spice and have a really hot oven with the grill turned on? Hi, like you I leave the skins on for extra fibre, I toss them in a roasting dish with a drizzle of olive oil and a pinch of sea salt and pepper. Shake the dish to coat the fries with oil and seasoning and then put in the oven at 220 degrees celsius (not sure what this is farenheit) for 30 - 40 minutes checking half way through and shaking the dish again to make sure they are evenly cooked. Hope this helps. I often make oven fries as I hate the mess and the smell in the house if I fry them. I cut mine into sticks, rinse and dry them, then put them in a bowl. I add a little corn or vegetable oil (These cook hotter than olive oil) and some salt, pepper, oregano and sometimes a bit of cayenne pepper. Meanwhile, I let the flat, baking pan(s) heat in a 400 F oven. When I tip the fries in, they start cooking immediately. After 15 - 20 minutes, I shake the pan(s) to loosen the fries and continue cooking for another 20 minutes, or until they are brown. Easy. Sugar / salt water pre-soak, check Pioneer Woman for recipe and spread much further apart on the pan. No touching helps them steam up and become soft and then crisp up with the oil afterwards. I want to highlight what a few others have said about overcrowding. It's so important to not do that with any food that you want to turn out crispy. As you cook, the water in the food is heated and evaporated. If everything is crowded together, your food ends up steaming instead of baking and getting crisp. Going off what you have in the pictures, I would take a third or half of those fries off and put them on another pan, then bake the pans separately. You have to soak them in some water for at least 15 minutes and rinse them well to remove excess starch. Then dry them off well. Too much moisture and they wont crisp up. You also need to toss them in a little bit of oil. 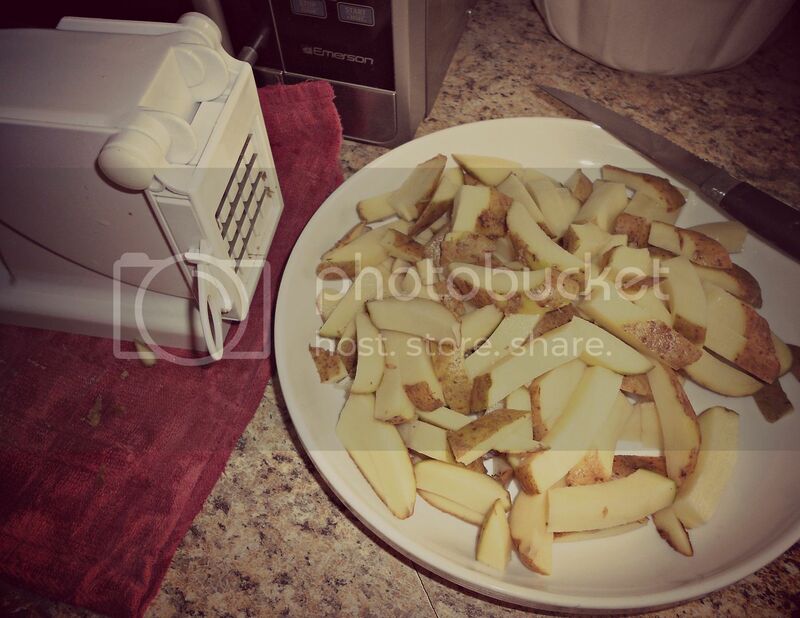 It also helps to preheat your pan with the oven before you put the fries on the pan. The potatoes are going to crisp up better on a hot pan than a cold pan. Cook for about about 15-20 minutes at about 425F and then flip your french fries over and cook for about another 15- 20 minutes. My family LOVES french fries. It's my cheap go to side dish since I have some very picky eaters. I prefer to peel my potatoes first (my littlest one has trouble eating the crispy skin), then I toss them in a bowl with oil and seasoning, spray a pan with cooking spray, lay out the fries in one layer and bake at 450 flipping them over once. How long I bake them depends on how much time I have. Sometimes I let them get really crispy, other times I just bake them until they are not really mushy and won't break. I haven't had any complaints yet. I am a horribly lazy cook and I haaate rotating things in the oven so they'll be crispy. The best thing I've discovered is placing a cooling rack in your jelly roll pan and baking the fries on there rather than in the pan itself. No rotation! So nice! I also just use cooking spray to season them. Just lay them all out, spray 'em, do whatever seasoning you desire (we like garlic salt, awww, yeah! ), and bake them at 425 degrees for maybe twenty minutes. Like I mentioned, lazy cook here, I just jimmy-rig as I go so I don't really have a recipe, lo siento. But seriously, baking on the cooling rack has saved me from all prep time. 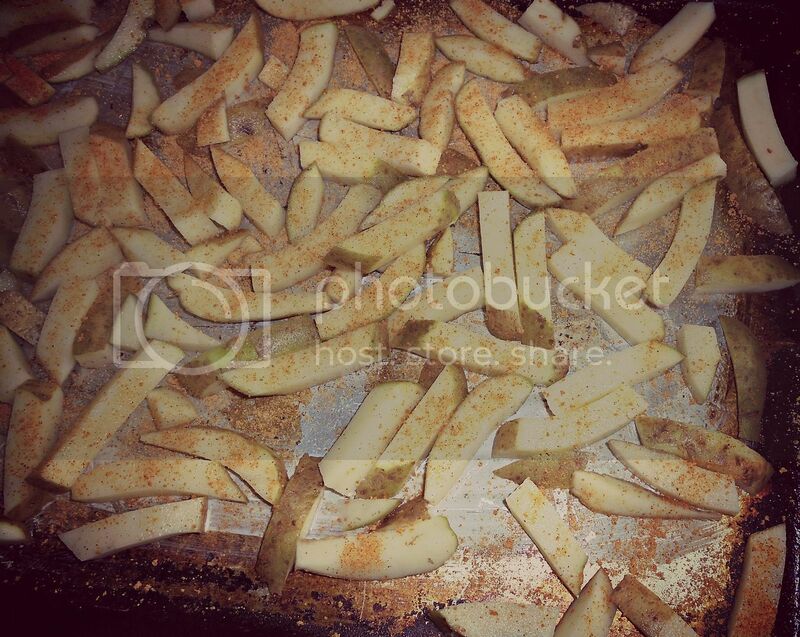 All I do is cut the potatoes, spray, season, cook on the cooling rack, and bah-bam, crispy fries! No pre-soaking (I would always forget to do it in time), pre-seasoning, rotating, nada. We slice ours to look more like potato chips, but thicker, & leave the skins on. Just line a cookie sheet with foil, spray with canola spray & then season the foil with season salt (yes, you read that right). Then layer the potatoes on the cookie sheet & top with season salt (though for a different flavor to go with Italian chicken, you can use garlic salt & Parmesan cheese). We soak our fries in water for at least 30 minutes after we cut them. Drain well then rinse again, pat dry them with a towel. We oil the cookie sheets and then make sure fries are single layer when placed on sheets.... We drizzle a little oil and season if desired and toss/rub the fries around to distribute everything evenly then jiggle the sheet to make them single layer again..... Bake in 400 degree oven for 15 minutes then rotate the cookie sheets (one on upper rack goes to the lower, lower goes to upper rack) and bake for another 10 the key is to Broil the fries for a few minutes then flip and broil till brown on the other side. Good luck!! We soak ours in hot water and then dry on a towel before baking. It removes the extra starch and makes them very crispy. I like parmsean garlic baked fries so I just toss the cut potatoes in evoo, garlic, and grated parm and if I want something a little spicy I just add a little red peppers flakes. Then i just bake at 375 to 400 for I dunno how long I just check for golden brown color.